Hurtigruten in Tromso, surrounded by spectacular Arctic scenery! 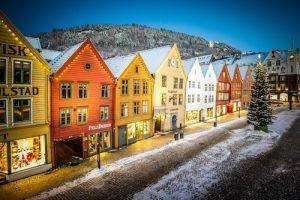 Norwegian Winter Cruise starts with a night in Oslo and Kirkenes, then a 5-night cruise from the rugged Arctic wilderness of Northern Norway to the magnificent coastal landscape of Western Norway. Enjoy dog sledding in Kirkenes & shore excursions on Vesteralen Islands and in Trondheim. Watch out for the Northern Lights! 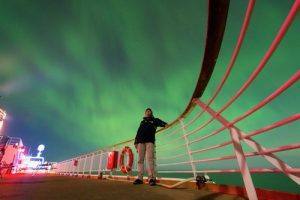 A cruise with Hurtigruten offers good chances to see nature´s own lightshow at sea. The tour starts in Oslo and ends in Bergen. You can add extra nights & shore excursions to the trip. Individual arrival to Oslo. 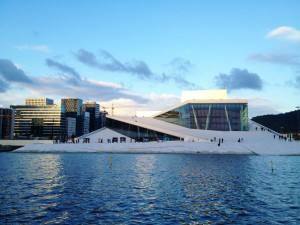 Overnight in the centre of Oslo, or at an airport hotel at your choice. The centre of Oslo is located only 20 minutes from the airport by the Airport express train (Flytoget). Transfer to Kirkenes Snow Hotel and check in at an elegantly-designed wooden Gamme cabin. The package includes dinner and breakfast at Laven restaurant. 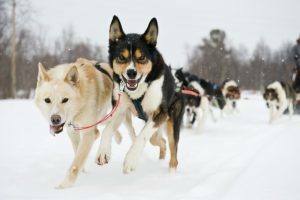 Wilderness Dog sledding – Join an adventurous 2-hour dog sledding trip in the afternoon. The tour goes in scenic surroundings over the fjord and on the mountain plateau. Embark the ship after breakfast for a cruise to Vardo, Norway’s easternmost town, with the enchanting Vardohus Fortress. Continue along the Varanger peninsula before a late evening arrival at Batsfjord. All meals are included while on board (food only). 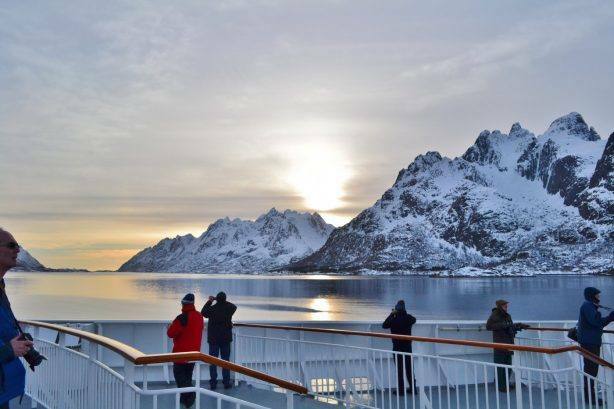 Cruise via the Arctic town of Hammerfest, across Soroysund to Oksfjord. The course is set via Lopphavet open sea and the ship finds quiet waters towards Skjervoy island and the Arctic town of Tromso. Arrival to Tromso in the late evening. 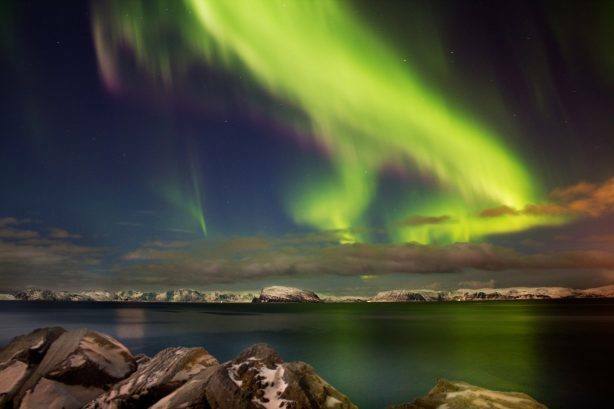 Set right in the middle of the “aurora zone,” this city and its surrounding wilderness areas are ranked among the best places on earth to observe the incredible Northern Lights in the night sky. 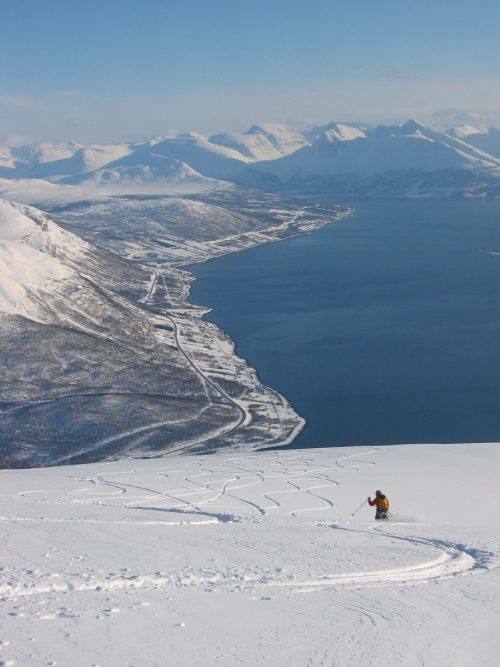 You will join an extensive excursion across the spectacular Arctic archipelago of Vesteralen. 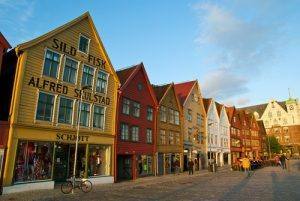 Visit a medieval church and admire the breathtaking scenery of beautiful fjords and steep mountains. You will rejoin the ship in Sortland. 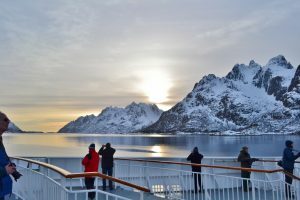 The southbound sailing route continues torwards the Lofoten Islands, and the ship calls at Svolvaer – the capital of the Lofoten Islands – in the evening. Early morning call at the village of Ornes, before the ship continues with short stops at Sandnessjoen and Bronnoysund. The Helgeland coast is known for its remarkable beauty with unique mountain formations, islands & the Arctic Circle. Early arrival to Trondheim. After breakfast, enjoy a two hour city sightseeing tour of the historic city. 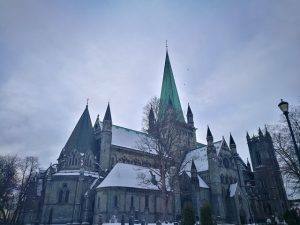 You will get to know Trondheim’s streets and highlights, including a short stop at Utsikten (the View). 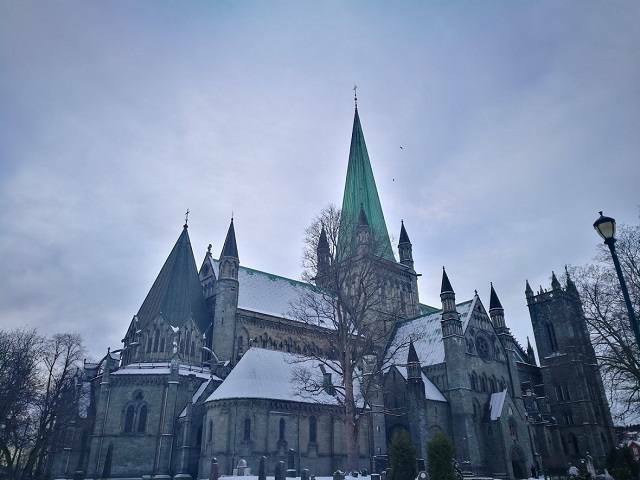 You will also have a guided tour of the Nidaros Cathedral, the northernmost medieval cathedral in the world. Arrival to Bergen at 14:30, check in at a centrally located hotel. Spend 1 night in this picturesque, colourful city with the UNESCO Bryggen wharf, the hillsides and Nordnes peninsula with authentic, tiny, wooden houses and narrow streets, the Funicular to mount Floyen, the Aquarium. You will stay in one of the new beautifully designed wooden warm cabins with modern architecture built in the wilderness. The cabins are located 100 meters from the main building at Snow Hotel, have spacious rooms and immense windows with beautiful view on the snow and Northern sky. During your visit you can also visit the reindeers, the husky farm or stop by Gabba café, the authentic wooden sami hut. Warm yourself by the open fire, and get a hot drink, lunch or pastry.